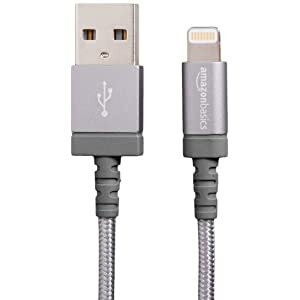 This AmazonBasics Apple Certified Nylon Braided Lightning to USB A Cable is perfect for your home, workplace, car, or nightstand. 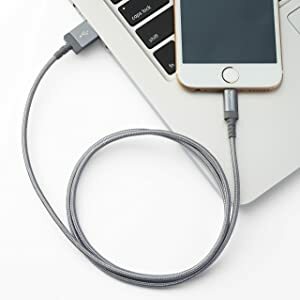 The AmazonBasics Apple Certified Nylon Braided Lightning to USB A Cable features high-quality copper wires that maximize signal quality and increase durability. Instead of plastics or Polycarbonate, the cable uses a unique nylon fiber cloth for its protective cover. Wound tightly around the cord, the high-tensile nylon fiber cloth offers superior strength and a bit of flexibility. 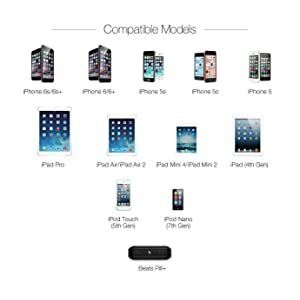 For complete charging and syncing, this cable works with Apple devices that have a Lightning port, including the Apple iPhone X, iPhone 8 Plus, iPhone 8, iPhone 7 Plus, iPhone 7, iPhone 6s, iPhone 6, iPhone 6s Plus, iPhone 6 Plus, iPhone 5C, iPhone 5S, iPhone 5, iPad Air / Air 2, iPad mini / mini 2 / mini 3, iPod nano (7th generation), and iPod touch (5th generation). 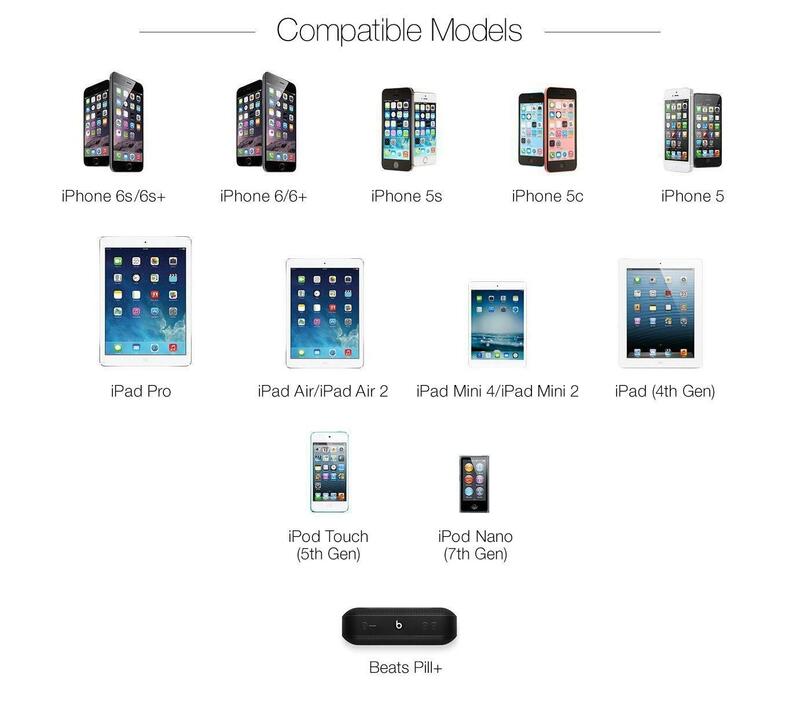 It’s compatible with the latest iOS 9. 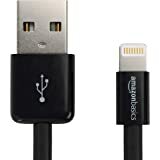 Note: Power output should not be above 5V, 2.4A or 6V, 3A when charging your phone with this AmazonBasics charging cord. Bought 10 of those and they are only 1 month old but all 10 of them still work. They look sturdy too but my experience is that it does not count for much so hopefully I can report back after 1 year and give a more useful review. 1.0 out of 5 starsWhat a bummer. 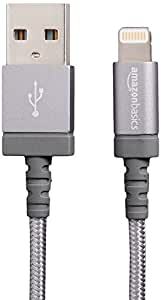 Gotta say I'm a huge fan of Amazon and even their Amazon Basics stuff is made pretty well, but this cable has officially died on me. I bought this cable way back in May of this year. 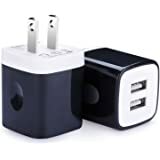 I bought it to leave at work, should I ever need to charge my phone there. I had used it occasionally and only just recently had I really noticed how slow it charged. 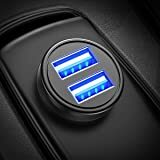 With in the last couple of weeks I would plug my phone into charge for the ride home from work and realized that it hadn't really been charging at all. I've used it little over 10 times and it really only ever worked around 3 times early on. Now as I'm writing this review I have it plugged into my computer and still no luck. What a bummer. These just don’t last. I have purxhased several and they all break shortly after you begin using them. Purchased a number of these...usually last a few months before noticeable ‘burn’ marks. the Apple Store genius said the iPad ends all had signs of arcing, leading to ‘unsupported usb device’ error message and failure to charge. In fact, the battery failed and the iPad replaced. How much faulty cables contributed to this failure is unknown. The construction of mesh, wire and rubber strain relief is fine, connectors not. Search for cables that last more than a few months continues. 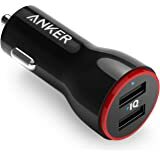 This works poorly in transferring data from my iPhone 7 to my 2015 Nissan Frontier. For example, transferring my iTunes from phone to truck via this cord gets stuck at 1 % transferred. 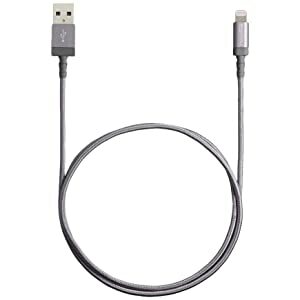 I never had this or any other problems with the Havit cord I wore out over three years previously. I’m going back to a new version of the Havit—but I probably won’t be buying it via Amazon. It was working great but on the tenth day the cable started to peel of a little on the charger side and eventually stopped working. I totally forgot about it to return and the 30-day return period crossed.